Business travelers travel light. Long ago we learned that the formula for disaster on a business trip was to depend on the airlines to deliver luggage on time and undamaged. Woe betide the road warrior who makes the mistake of checking baggage that contains something vital to a business meeting or is otherwise irreplaceable. trip was to depend on the airlines to deliver luggage on time and undamaged. contains something vital to a business meeting or is otherwise irreplaceable. Believe me: Checked baggage is the last place you’d want to store something that actually has value. 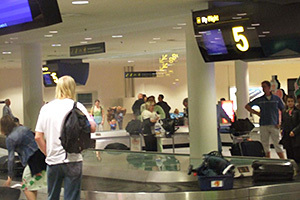 reimbursement by the airline for lost/delayed/damaged bags? tons of lost bags we still see? companies had researched the idea, but the airlines and airports never bit. black eye, but, unfortunately, it seems their views have yet to carry the day. revenue opportunity for insurance companies. We don’t want insurance payouts. honor their promise to deliver to their customers.